I will give notice and make alternative arrangements when I have booked performances which may clash with your lesson. What type of students do you teach? My students love the bass and they’re eager to learn more and progress faster. I teach school age children up to mature age students of all ages. As a past VCAA examiner for Solo Performance Unit 3 & 4 (Bass), I am a specialist VCE Solo Performance Bass teacher Unit 3 & 4. As I currently teach in a Victorian school I have an employee Working With Children Check. My WWC Check is current and expires on 14 Apr 2021. Where are the bass lessons held? Bass lessons are held in my music recording studio located within the new housing golf estate of Sandhurst 3977. Adjacent suburbs to Sandhurst are Carrum Downs, Skye, Cranbourne West, Lyndhurst, Bangholme and Patterson Lakes. Do you teach at any schools? I am currently the senior bass teacher at Beaconhills College in Berwick. I also teach sessionally at The Australian Institute of Music (AIM) in the city. Previously, I was the head bass teacher at Haileybury senior campus for 4 years till 2004 and a VCAA examiner for a few years too. I have either performed in the school productions or privately taught students from these schools – Caulfield Grammar, Wesley College, Mazenod College, Whitefriars College, Kingswood College, Xavier College & St Leonards College. Can I hear you play bass? Yes! I have a 3 year full teaching qualification – Diploma of Teaching (Primary) from Monash University. I also graduated from The Victorian College of The Arts with a Diploma of Arts (Music Improvisation). … And just to be a bit geeky a Graduate Certificate in Information Systems from Swinburne University. You’ll learn to read music if you commence bass lessons with me. Learning to read notes on the stave will empower you with great confidence. I have written a bass book and DVD which steps through the basics and I guarantee you that I can teach you this with ‘little or no pain’. Learning to read music opens up so many possibilities for a future in the music industry. I believe that playing by ear is also very important and I employ techniques and exercise to develop your ear as you progress. Read some stories from bass students whom I have previously taught. How do I start bass lessons with you? Easy! How does a 60% discount sound on the first 3 x 30 mins lessons? 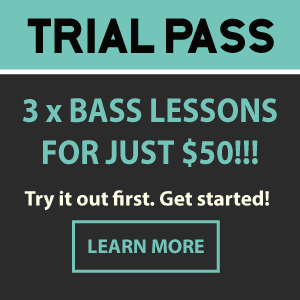 For my first time new students, I offer a Bass Lessons Trial Pass which entitles you to 3 weekly lessons and it’s just $50 bucks. You could even buy one as a gift voucher for a family member or friend. There’s no obligation to continue beyond the three lessons so there’s no stress. You can buy the Bass Lessons Trial Pass online via paypal and you’ll receive a confirmation email with simply instructions to book in your first lesson. It’s that simple.